Behind the Numbers: What one site can tell us. We’re all aware that things are constantly changing and doing so faster then ever in the world of web. New challenges arise daily. 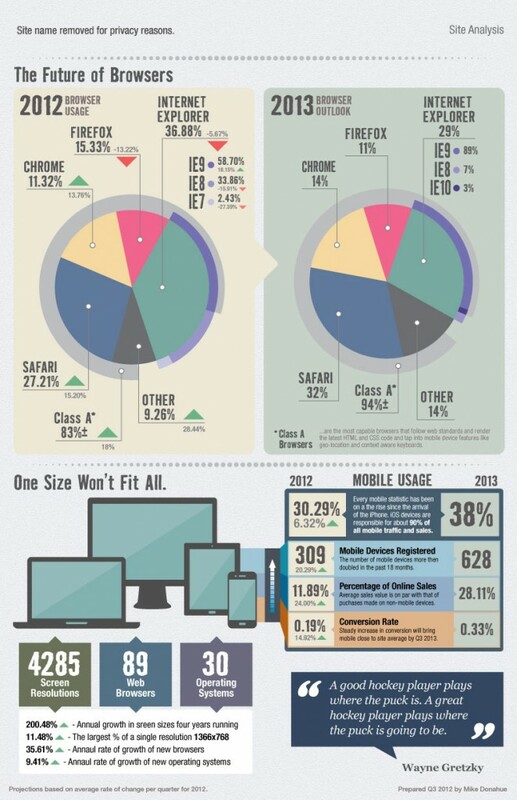 More browsers, more devices, more screen sizes, changing user contexts and much more. Sometime looking at things in new way can paint a more clear picture of the reality. So I’ve taken some time to look at one online properties to see just what we’re up against today and to try to offer some insight on where we’re likely to be this time next year. Continue reading Behind the Numbers: What one site can tell us. Posted on October 31, 2012 August 30, 2013 Categories Case Study, Mobile, Responsive Web DesignLeave a comment on Behind the Numbers: What one site can tell us.